Mine looks quite different from his because I did a Halloween theme and so used orange, black and brown inks - but most of the techniques are there! 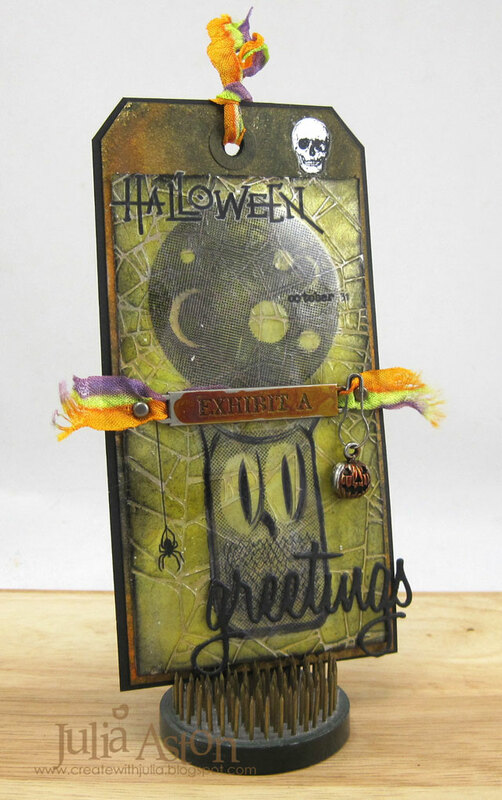 I used stamps from Half Tone Halloween instead of butterflies and I added some Curiosities Remnant Rubs. I didn't have the Alcohol Ink paper Tim used (I don't know if I've ever even seen that sold??!) so I used a specialty paper I had that I thought might work for the technique - I swiped the panel through the following colors of Alcohol inks I put on my craft mat - Butterscotch, Espresso, Ginger, Citrus and Silver Mixative Alcohol Ink as well as alcohol blending solution. After it dried - I used Tim's Shatter Stencil along with Wendy Vecchi Translucent embossing paste over the panel. Then you stamp the images on the panel and stamp them again on Acetate, cut them out and layer them over the stamped images. Tim used Frosted and I just used clear acetate. He also heated the butterflies and bent them but I couldn't do that with the images I used so mine are flat. 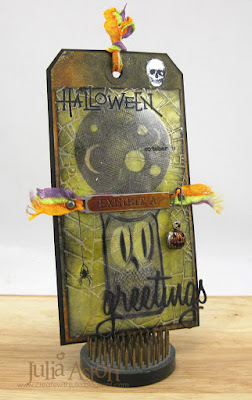 I dropped Butterscotch Alcohol ink over the Exhibit A word band and the little jacko-lantern from Oddities/Adornments. The greetings was cut with Holiday Words/Script. The colored ribbon was a free gift with an order from Linda at Funkie Junkie Boutique! 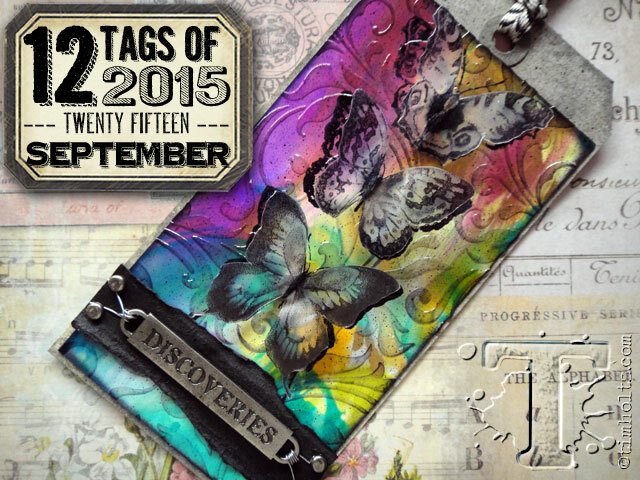 So, I'm happy and relieved that I had success with Tim's September tag! I hope everyone has a great weekend. The town I live in is celebrating Founder's Day on Saturday with the center of town blocked off to traffic and lots of people selling things at booths and the school's run games and there's lots of great food! Then on Sunday there is going to be a special Honoring the Military parade that's going to be about 2 hours long - with high school bands, Fife and drums, bagpipes, soldiers marching and lots of military vehicles - part of the town's 200th year celebration - and I just have to walk to the end of my street to see the parade go by! What a cool tag Julia! Love it! Sorry for being absent lately...life got in the way of crafting and blog hopping, I promise to catch up soon! Take care Julia! 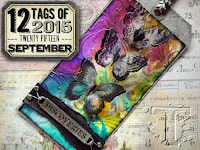 Such a cool retro take on the September tag, Julia - love the muted colour too. 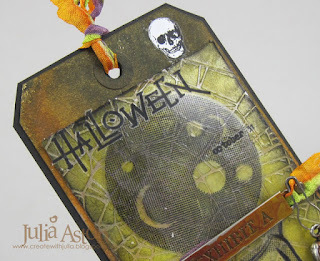 Awesome Halloween tag Julia! Love your take on Tim's challenge! Hope you have a fun and crafty weekend! 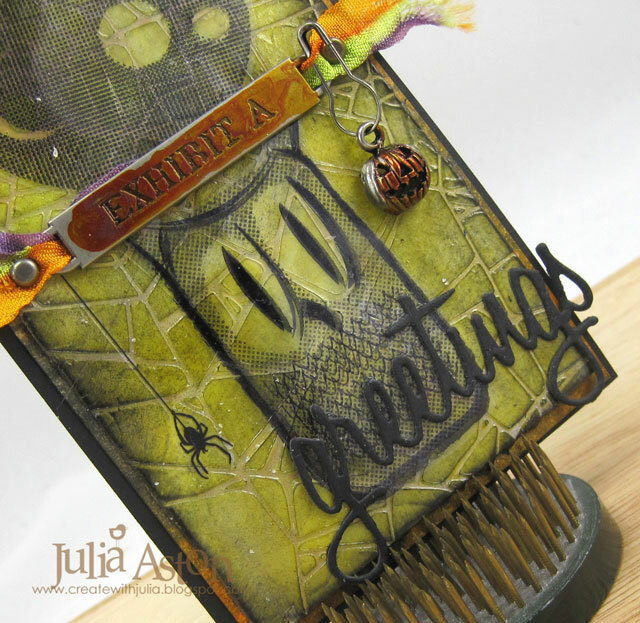 What a scary, and awesome tag, Julia! I'm a bit green with envy about your Founders Day festivities! Enjoy!! WOW....this is just so incredible! You are so talented, love this! Finally catching up on some commenting...sorry it's taken me so long to get back to your fabulous blog! What a gorgeous and spooky take on Tim's tag, Julia! The colors are amazing and I love your interpretation! Congrats on your win over at Tim's! Well deserved!!! Yay you!!! Congrats on the win!!! Your tag is wonderful! LOVE the Halloween theme, and the center word band!